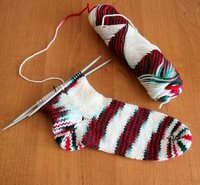 So, I'm knitting the Socks of Chaos with my mysterious yarn. Why mysterious? Because I bought it on the on-line Polish auction, and the seller only new that it was acrylic (yes, I know, all wool and silk connoisseurs look at me with disapointment and disgust... ^^), and that it was from the USA. No name, no gauge, no paper band with details. So I bought it. Now, could someone tell me what it is? 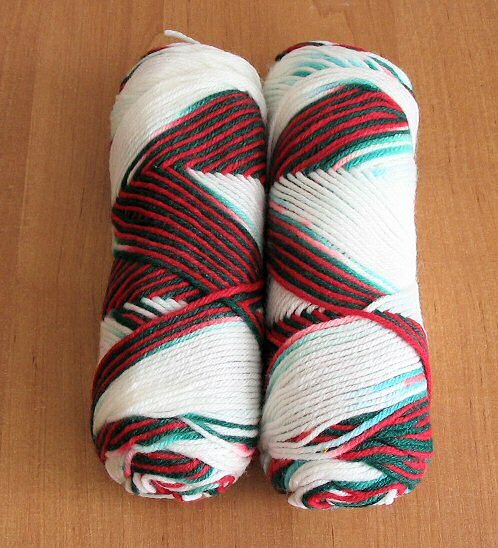 Can someone tell me if there is a way to knit this in regular stripes? I think the way it looks now is interesting and totally lives up to the name I've given these socks ^^, but I was wondering about the method of more regular knitting. I loosesly follow the instructions found here: thank you, Wendy! ^^, but my gauge is different, so I must improvise. Frankly speaking, I'm surprised that it fits quite well, and I'm scared that the second one will be totally different ( call it the Fear of Knitting In Pairs syndrome...). But we'll see about that, because I still have lots to knit of the first sock. I want to make it as high as possible, because I have three skeins and I'm still in the middle of the first skein. I treat this as a dry run before the socks from the book by Nancy Bush, and before I start to knit with my beautiful Opal yarn (I decided to buy special needles for this yarn - Clover 3 mm. They are damn expensive here in Poland, but well... this yarn deserves some treat! ^^ And I deserve a new pair of sock needles, and I always wanted to try Clover bamboo ones, and frankly speaking I also need 4 mm needles, so it might even be a double purchase, who knows?... ^v^). I was looking at your finished projects. Impressive, indeed! What pattern is the cable neck warmer? It is so pretty. Whoa, those socks are crazy! They kind of remind me of peppermint. Or Christmas. No idea how you could change the patterning, except to alternated skeins (and I'm not sure that would work in this case). I like the story about your belly dancing class - very funny! All those people mysteriously not turning up for class on the day of the exam.